In Mexico City in the 1970s, one of the most popular restaurants was Sanborn's. Owned by the family famous in this country for their coffee, Sanborn's had taken what in this country would have been a drugstore and fountain counter, the kind we used to have at Read's and such places in the 1950s and 60s, to the level of almost a fine dining experience. Sanborn's flagship store was the Casa de Asulejos, the House of Blue Tiles. The walls in their coffee shop were covered in blue and white ceramic tiles, in a Mexican version of Delft. It was a huge tourist attraction. Local people ate at the other Sanborn's locations. In 1973, there were almost as many Sanborn's as we have Walgreen's in the US, or Boot's in London. The restaurant had lots of local favorites, including Menudo Mexicano, Enchiladas, and a Sopa Seca that would make you want to slap your mama. But their signature dish, served for breakfast and for dessert after supper, was Crepas con Cajeta. Crepas. That one is easy. Crepes. Very thin pancakes, rolled around a filling. Put the flour in a bowl, and make a well in the center. Into the well, place the eggs and the liquid ingredients. Whisk very well, until the batter is bubbly. You can keep the batter covered in the fridge for up to 48 hours if necessary. If you do not use it right away though, it will need to be beaten again just before use. Heat a skillet over high heat until a drop of water dances on the surface. Reduce the heat to medium-high. Into the center of the skillet, pour one ounce (2 tablespoons) of the batter. Turn the skillet so that the crepe makes a nice uniform round. Once the edges begin to curl up, flip it. After a few seconds, remove it from the heat to a warm plate. Let's talk about cajeta. It is caramelized sweet and condensed milk. You can make it, but it takes the better part of a day. 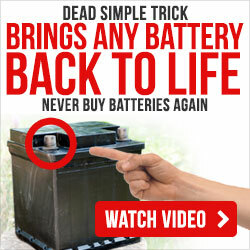 It is done by placing an unopened can of the stuff in a pan of water and boiling it for about 3 hours. Or, you can go to the store and buy it already done. It only costs about a quarter more than regular sweet and condensed, and there is no danger of it exploding in your kitchen. The best cajeta is made from goat's milk. Coronado makes a brand that is sold in the section with the chocolate syrup that is superb. Now that you have the cajeta and the crepes taken care up, it is time to assemble. For each serving, you should have two crepes. Place them on a plate, slightly overlapping. On each one, place two tablespoons of cajeta on each crepe. 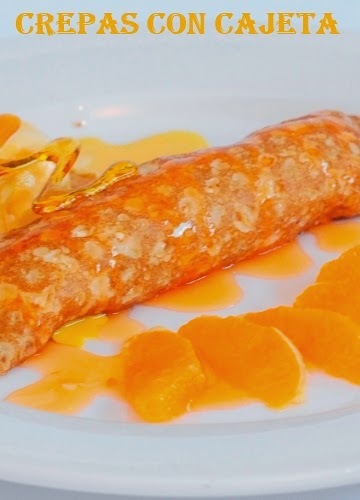 Roll the crepes into two little cigars, and then put a dollop of orange marmalade on top.